New York based Korean artist Changha Hwang moved to the United States in his early twenties and has shown active performances in overseas, mainly America and the Europe region. Hwang has consistently focused on creating abstract paintings comprised of unique color, geometrical structure, and three-dimensional space using basic painting medium, acrylic paint. Various colored sides and lines meet and create new space in his canvas and bring a three-dimensional visual effect in which the space are changeable according to perspective thus viewers are invited to freely explore the structures within the abstract world. Hwang’s visual interest stem from the patterns such as Islam tiles, traditional Jewish papercuts and Venetian lace makings. By the touch of the artist, such complicated images form a new pattern in his canvas and further create visual intensity by interconnecting with color and space. 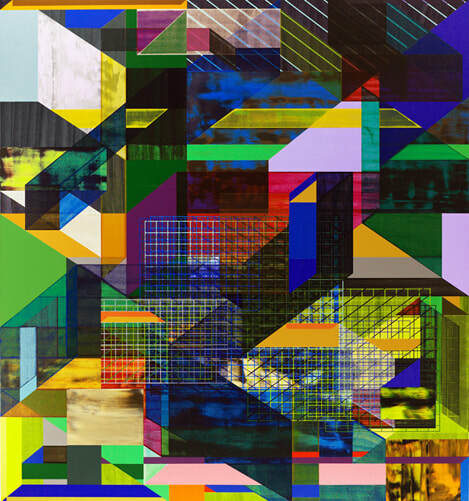 Hwang’s aim to create “the visceral tactility of the concept of relationship of space and time and the objecthood of the colors” in his painting is clearly revealed through simple lines and sides, experimental colors and demolition of the boundary between positive space and negative space. Therefore, each shape, color and space that are re-defined by the artist’s intuition remain to have its own uniqueness yet suggest a starting point for a new creation as they intermingle with surrounding environment. Drawing tactile illusions from visualization and creating three-dimensional space on a flat surface, his painting visually continues beyond the canvas and opens an infinite space where lines, colors, space and light and shadow repeatedly contract and expand. Changha Hwang majored in Painting and Drawing at Parsons School of Design, received exchange program scholarship to the Frank Mo Institute in Netherland and completed MFA at Hunter College in New York. Unlike the trend of contemporary art where figural representation and narrative expression are dominant , his works which pursue pure abstraction are shown in world major cities like New York, Paris, Madrid and Brussels through nine solo exhibitions and received constant attentions from art people at many prestigious art fairs he participated including FIAC, Amory Show and ARCO. At the end of 2007, Hwang was selected as one of 74 feature artists by the authoritative art magazine, ‘New American Painting’.